Back on the road after our stop in Carrollton, Josh and I marveled at what a great time we’d had wandering around a new place. 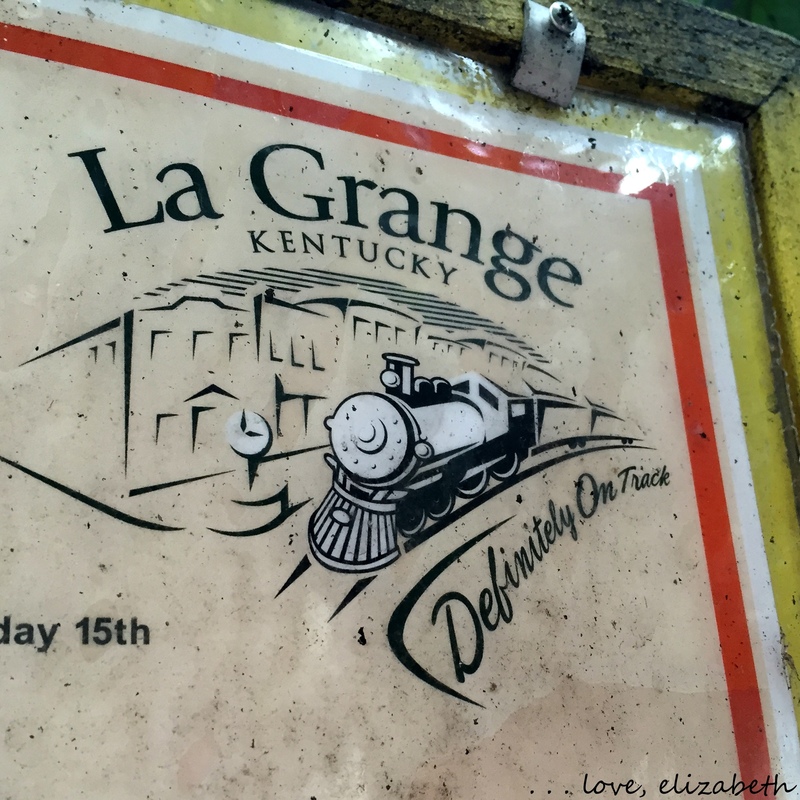 Thirty minutes later, we veered from I-71 once more as we followed signs for another historic point of interest: La Grange. Little did we know what a treat was in store for us as we pulled into a parking space on Main Street. After less than a block, we noticed a theme running through this town. 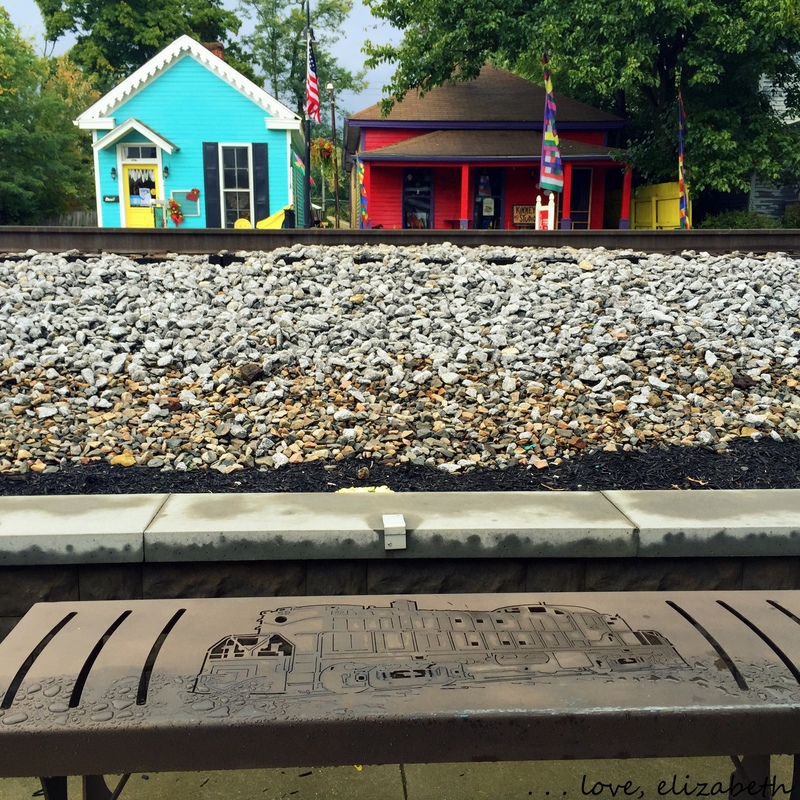 The benches, the signs, the artwork, and many other details all portrayed trains. And our path along the sidewalks of Main Street was indeed parallel to a set of railroad tracks that ran directly down the center of the road. 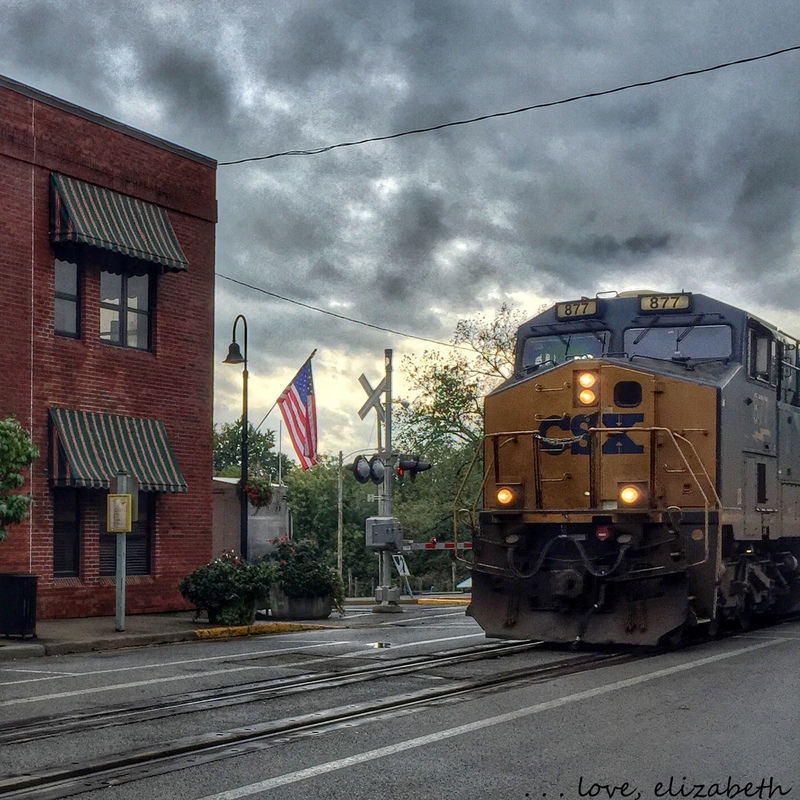 During our brief walk down Main, we learned just how proud La Grange was to be defined by the trains that ran through their downtown every few hours. 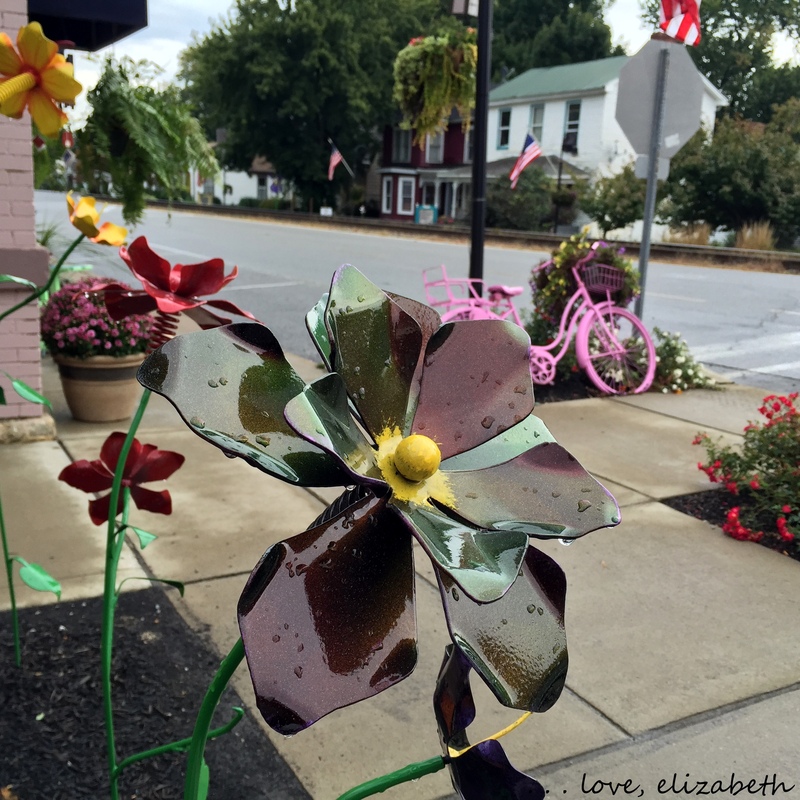 I listened carefully, hoping to hear a train, but the place was as quiet as you’d expect a sleepy small town to be. 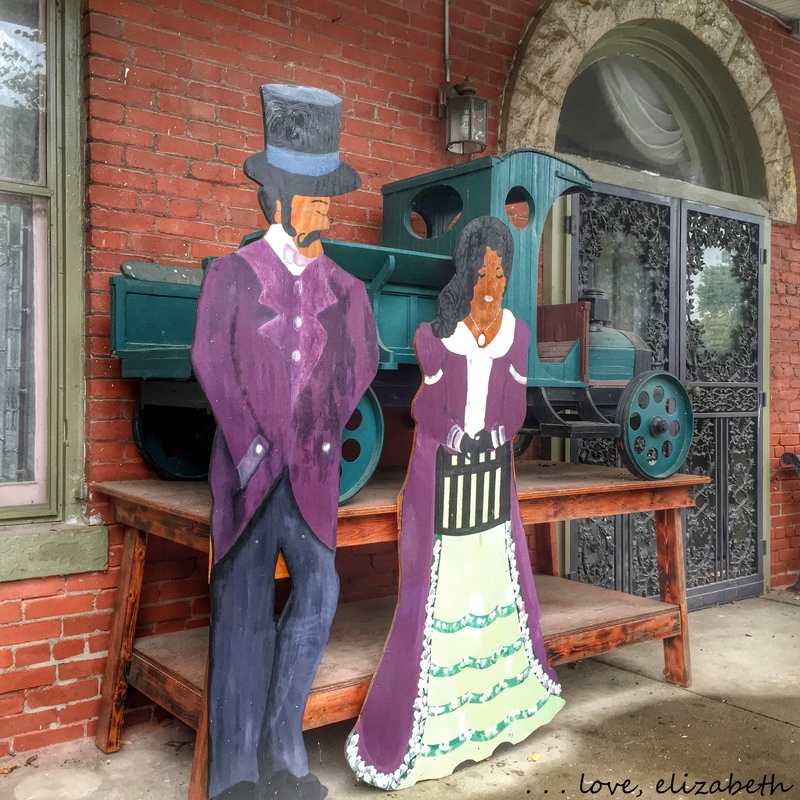 The road led us to the edge of the town, where a historic train and small exhibit were waiting to teach us more about why La Grange is so special. 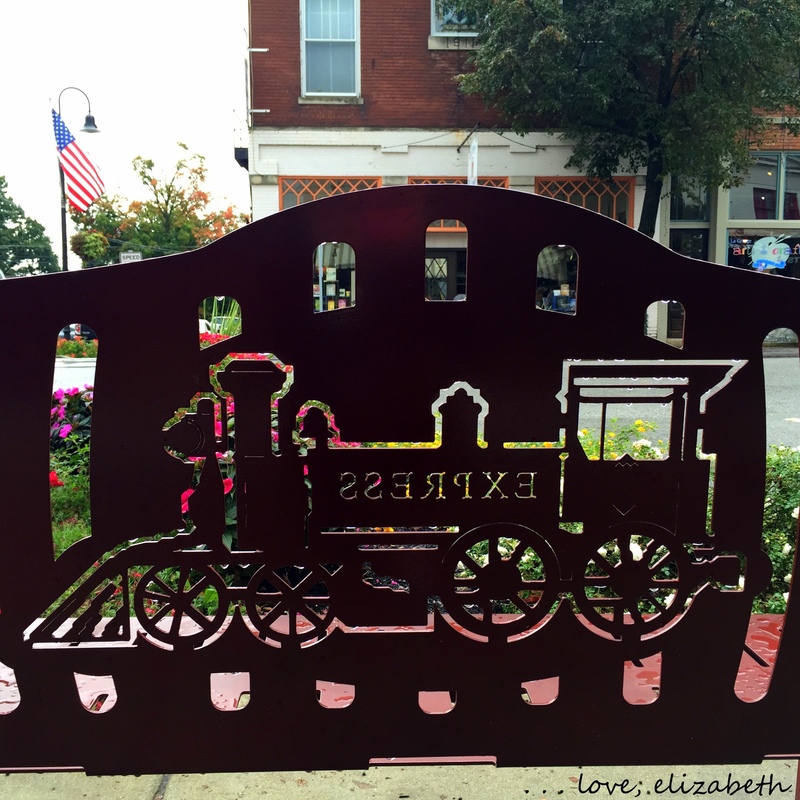 The train theme certainly ran strong throughout the town, but there were also plenty of other things that added to the overall mood of La Grange. A tree covered in hand-knit scarves marked the entrance to a yarn shop. A used book shop that also provided coffee and conversation was stationed on a corner across from a few artsy shops. 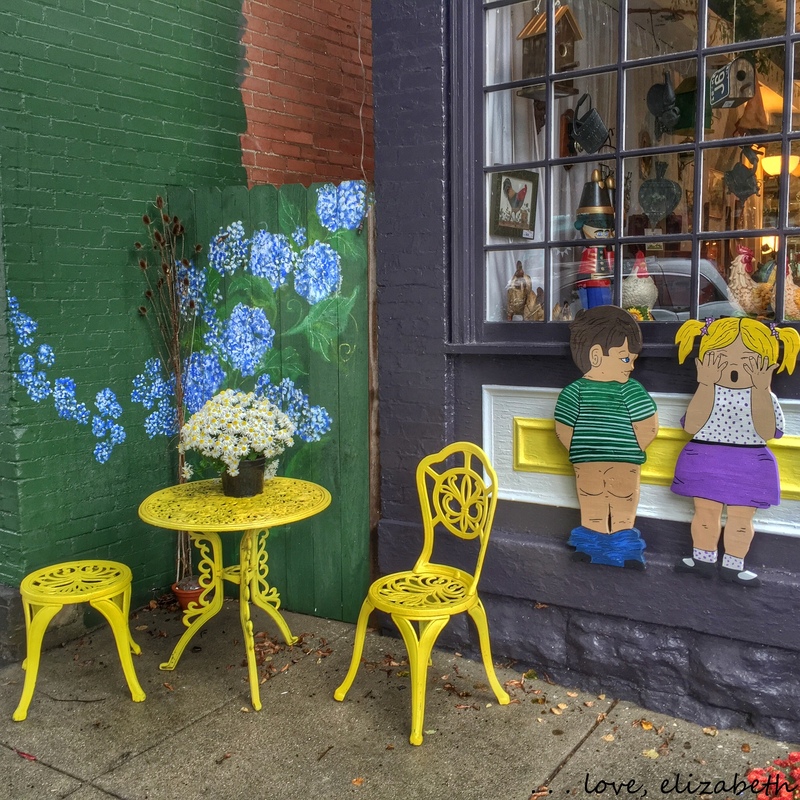 The sidewalks were lined with flowers, colorful buildings, and pieces of artwork, and I could hardly keep up with all of the quirky details that surrounded us. We felt that we could stay in La Grange for much longer (“Do you think they’re hiring any teachers here! ?” I asked Josh, only half joking), but the sky was darkening, and we sensed that we should be ready to move on before the next wave of rain struck. Not quite set on leaving just yet, we sat in our car and fondly looked over the photos we’d taken during our adventure so far. Soon, I heard what I’d been waiting for. “Come on, Josh! It’s showtime!” I exclaimed as I jumped out of the car and stood on the rumbling pavement, trying to figure out which direction we needed to point our cameras. “Here it comes!” I gleefully hopped up and down and pointed to the right at the train that was slowly lumbering toward us. We waited by our car and snapped photos as the train neared and passed by, just a few feet from where we stood captivated. And with that, it was time to move on from what had become our favorite little place in Kentucky. For now. 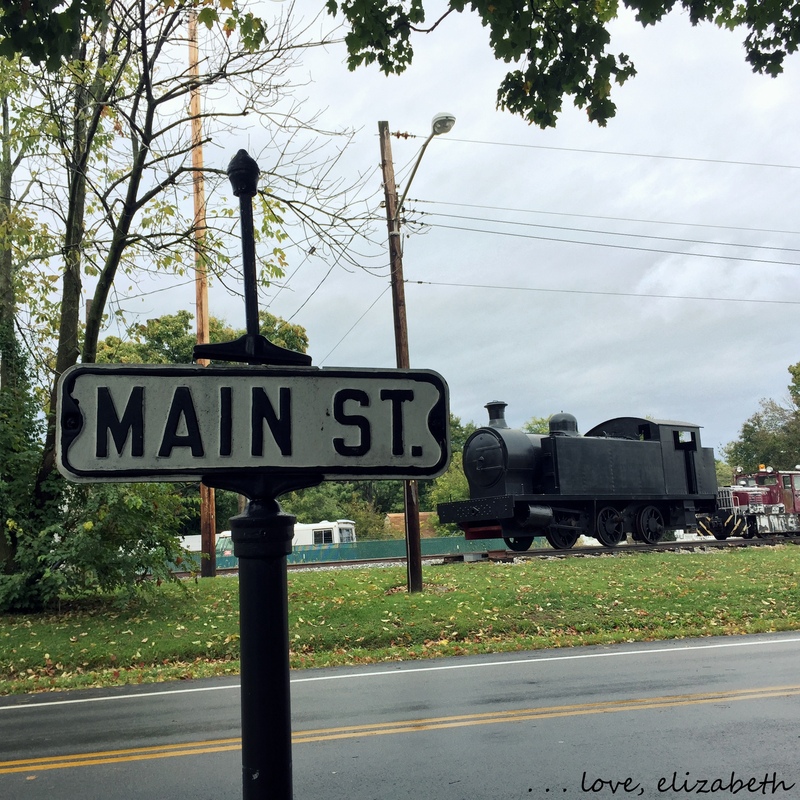 I can’t wait to stop back in La Grange, browse the cute shops, learn more about the town’s history, and have a picnic near Main Street while waiting for trains to pass by. It wasn’t until after visiting the town that I discovered it has a visitor’s center and a historical society. 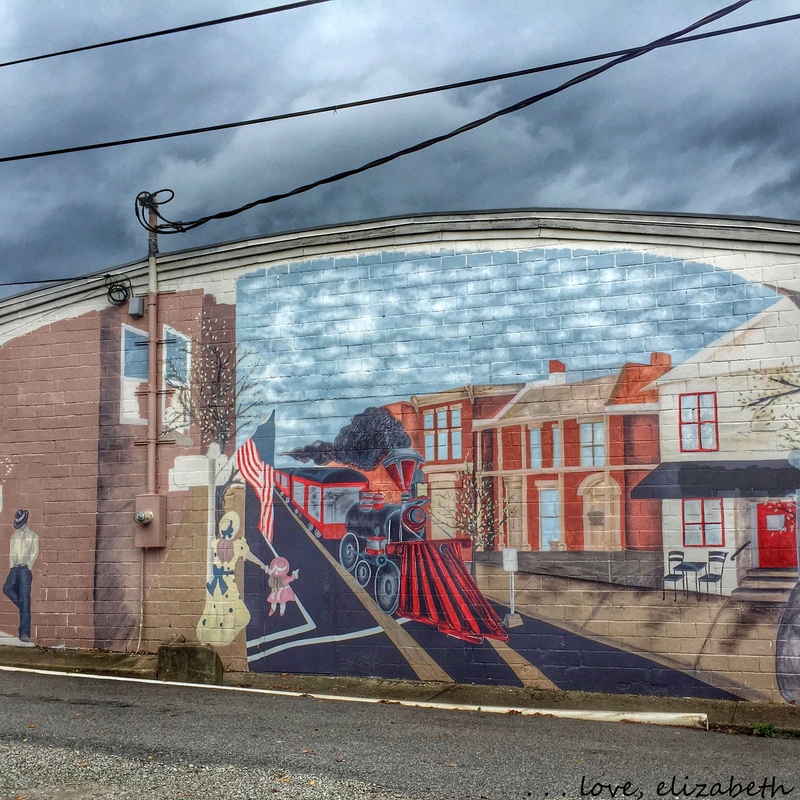 I’ll definitely be making use of those resources next time I visit so I can dig deeper into the interesting history of this little town on the tracks. I hope it won’t be long before I’m back in La Grange, and I hope you’ll agree with me that this place is right on track!